If you are looking for a friendly new place to the set the reels spinning then pay a visit to the brand new Hey Spin Casino. The casino is packed with games from Microgaming, NeoGames Technologies, Net Entertainment and more. The main casino is divided in to classic and video slots, casino games and scratch cards. 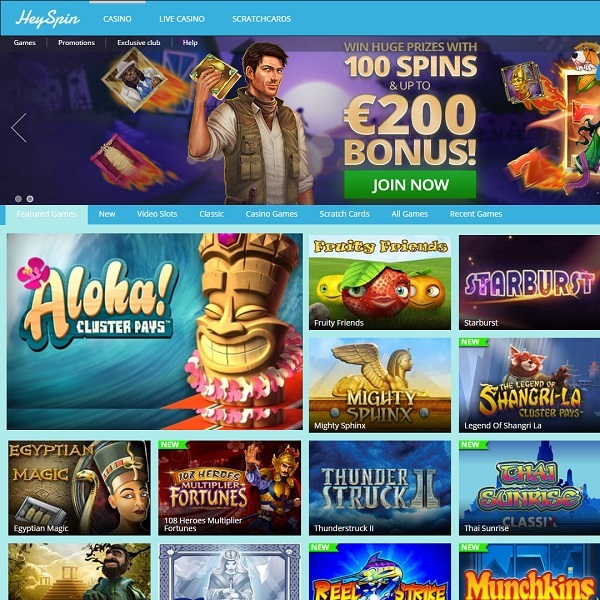 There is also a dedicated live dealer casino that is packed with high quality titles. Each of the sections contains a fantastic selection of games with more than enough to cater to every taste. New members of the casino are offered a 100% first deposit bonus of up to £200 together with 100 free slot spins. There are then numerous promotions on offer to take advantage of. The casino has been licensed in Malta and Curacao and offers customer support via telephone, live chat and email.